*Price per license. Quantity must be 5 or greater. *Price per license. Quantity must be 10 or greater. *Price per license. Quantity must be 25 or greater. Protect your Android devices against malware and other threats The market dominance of Android devices and the inherent openness of Android led to the proliferation of malware and Potentially Unwanted Applications (PUA). SophosLabs detected over a million new pieces of malware in 2014 alone, and the growth rate is accelerating. Malware can lead to data loss, reputation loss, additional costs, and reduced performance. The Sophos Mobile Security antivirus app protects your Android devices without compromising performance or battery life. The app uses up-to-the-minute intelligence from SophosLabs and the Sophos core antivirus engine. This means your apps are automatically scanned for malware as you install them. Sophos Mobile Security's consistent performance has earned recognition from independent testing agencies including AV-Test. Our Sophos Mobile Security antivirus app protects your Android devices with proactive identification of malware. Your apps are automatically scanned for malware as you install them. Sophos includes protection for PUAs and low-reputation apps-new apps that have no known history and may pose a threat. PUAs include adware, rootkits, diallers, and any association the app may have to previous malicious behaviour such as a certificate that has been compromised. Surf securely on the internet from your Android device. Sophos Mobile Security checks all websites against a SophosLabs database for known malicious sites and prevents users from accessing them. Some apps on your phone contain more sensitive data than others. App Protection allows admins to enable a second level of authentication with an additional password. The Privacy Advisor analyses all installed apps for potential privacy breaches such as attempts to access your personal data like your contacts. The Security Advisor analyses your settings and advises you on ways to increase your security. If you're interested, go to Google Play and download our free stand-alone version. Search for "Sophos Mobile Security" in the app store. Try the app for as long as you like, on as many devices as you need. Start with the simple Sophos Cloud interface to manage mobile security. The Cloud Mobile Security solution provides device- and user-security statuses, and delivers reports for monitoring, Find and Fix, and compliance. Sophos Cloud solutions facilitate the protection of endpoint, server, email, and mobiles via one console. Start with Cloud Mobile Security and then add Sophos Cloud Mobile Control to extend your mobile device management capabilities. Or implement Cloud Mobile Security in parallel with any existing MDM solution. Get centrally-manage mobile protection and gain visibility and control over app settings. Sophos Mobile Control Advanced executes your company's security policies using a complete Enterprise Mobility Management (EMM) solution. Protect your company from drive by infections. 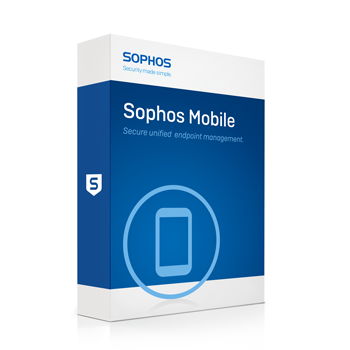 Download the Sophos Mobile Security Data Sheet (PDF). *Price per license. Quantity must be 50 or greater. *Price per license. Quantity must be 100 or greater. *Price per license. Quantity must be 200 or greater. *Price per license. Quantity must be 500 or greater. For more than 1,000 Users, please use Quote Request Form!